The following select projects are but a cross section of our diverse portfolio of work. 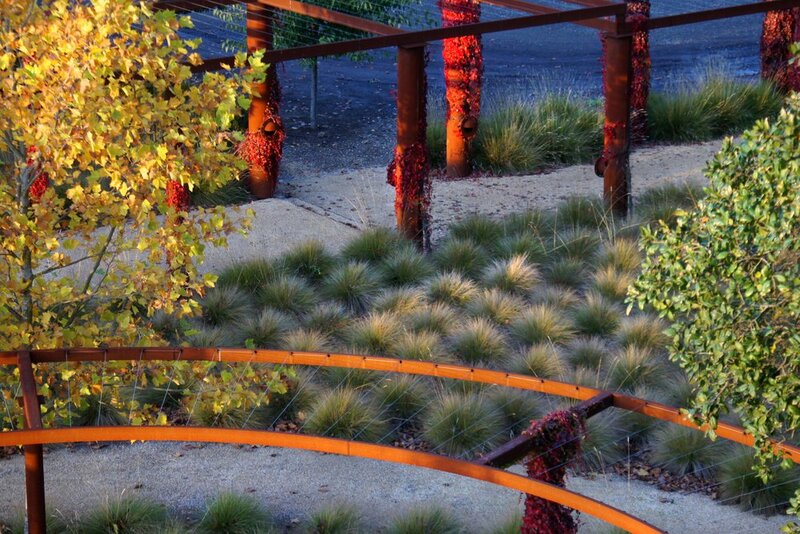 This body of work represents a variety of sites, architecture and client preferences that make each project special. While a common thread runs through them all, each one is unique and would be different if any one variable were altered or changed. 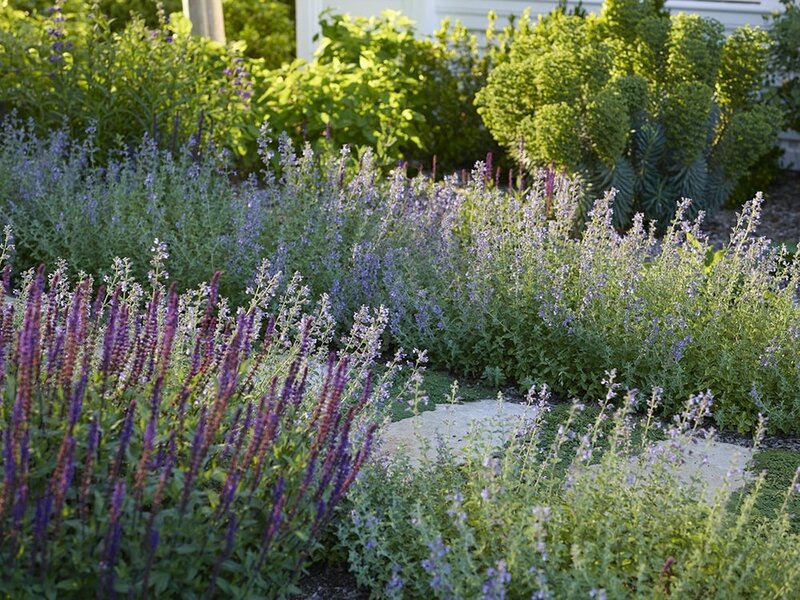 Like a thumbprint, each garden is different. We pride ourselves on not having a signature style yet our spirit is always expressed in our work. Enjoy! Editing and careful site analysis was the key to the success of this remodeled home and estate grounds. 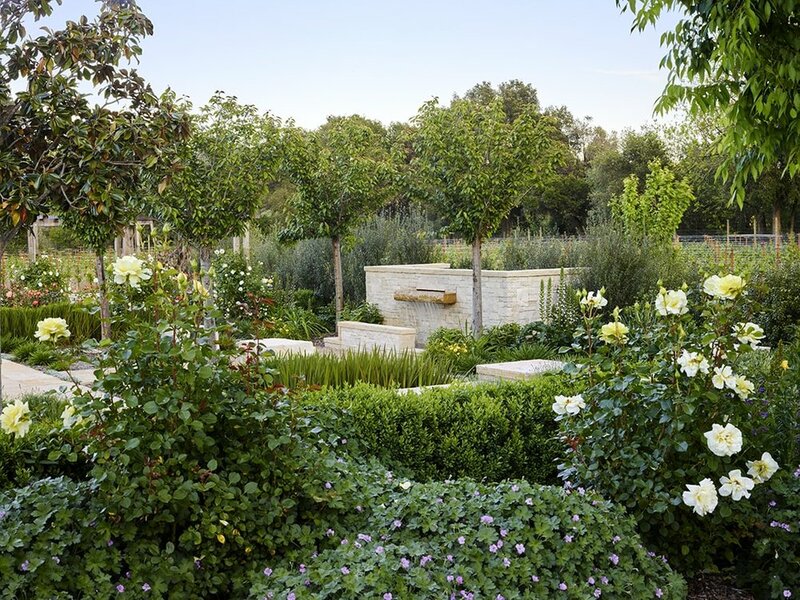 The slow removal of exotic trees and shrubs that once choked the site began to reveal unseen views and open the property up to the surrounds that had been hidden before. 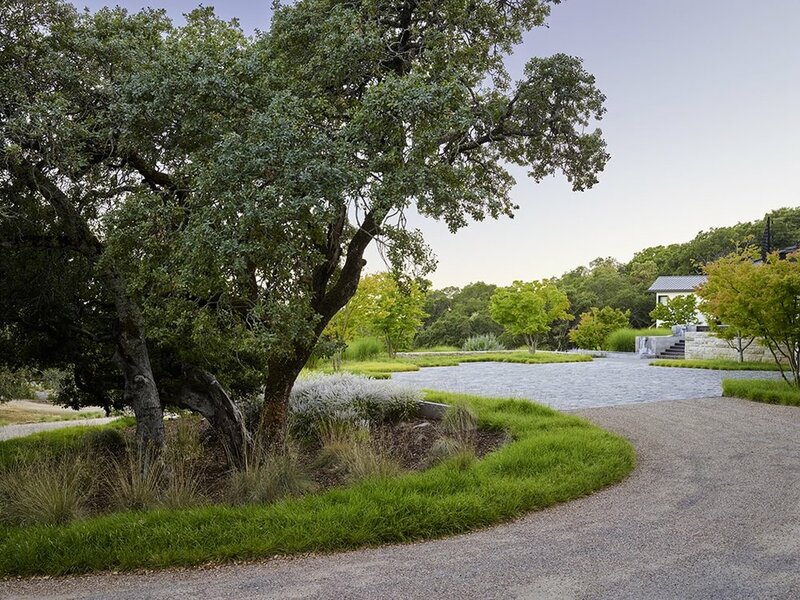 The removal of two massive hedges along the property lines exposed grassy, oak covered hillside that expand the sense of space and belonging. As exotic understory shrubs and trees were removed the canopy of the native oaks began to sing and the distant hills came into view. While spending time on the property considering the potential development, the back portion of the 4 acre parcel proved to be sheltered from the cooling winds that arrived every afternoon. 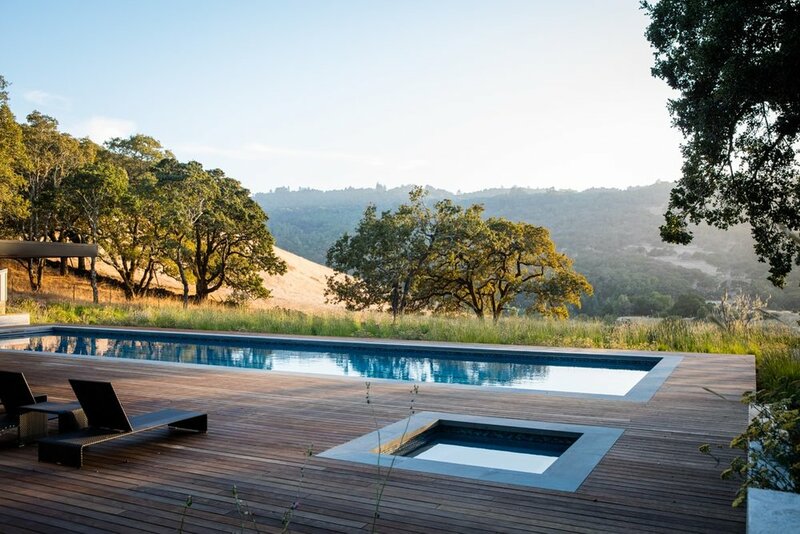 An existing tennis court was removed which opened up room for the desired lap pool and pool house that now basks in the warmth of the afternoon sun, celebrating a canyon view unseen by most. 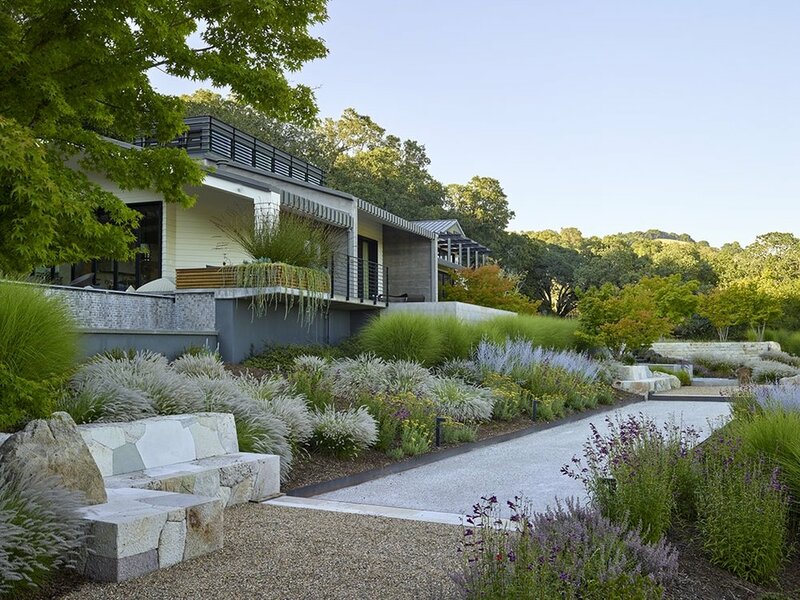 A bocce court neatly lays into the land and further anchors this tremendous area of recreation and relaxation. 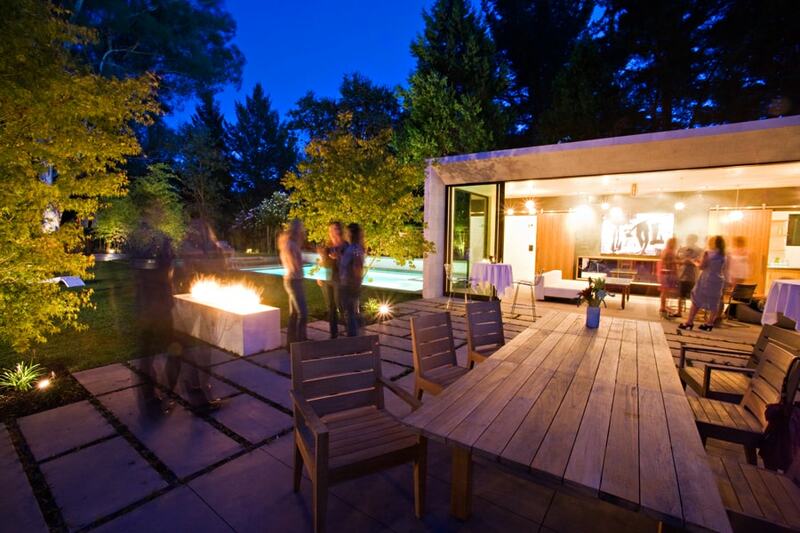 This uniquely modernized property is only minutes away from City limits yet feels a world away. 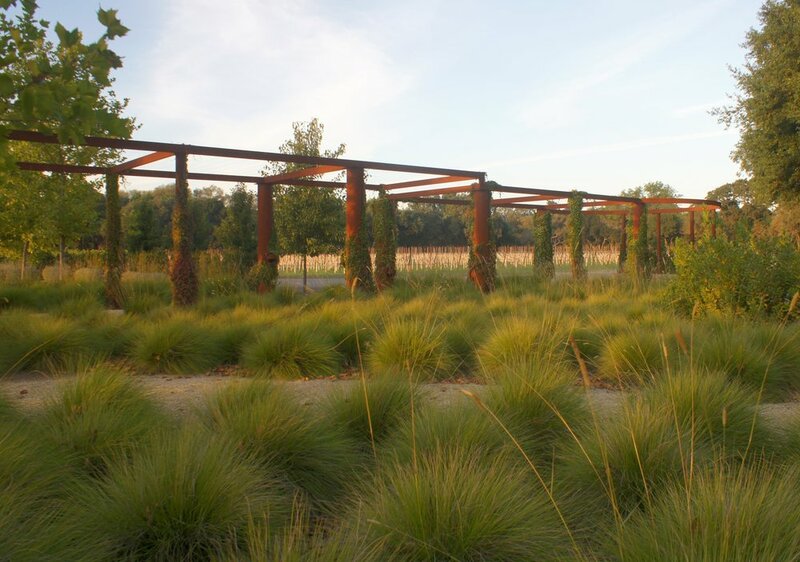 Stylized meadow plantings and native understory ground covers were utilized to seamlessly knit the grounds into the golden hills surround. This project represented a turning point for our firm as a premier commission. We were brought in during the final year of construction of the home and charged with making sense of the exterior spaces, which beyond the locating of the home’s main structures had not been convincingly conceived. 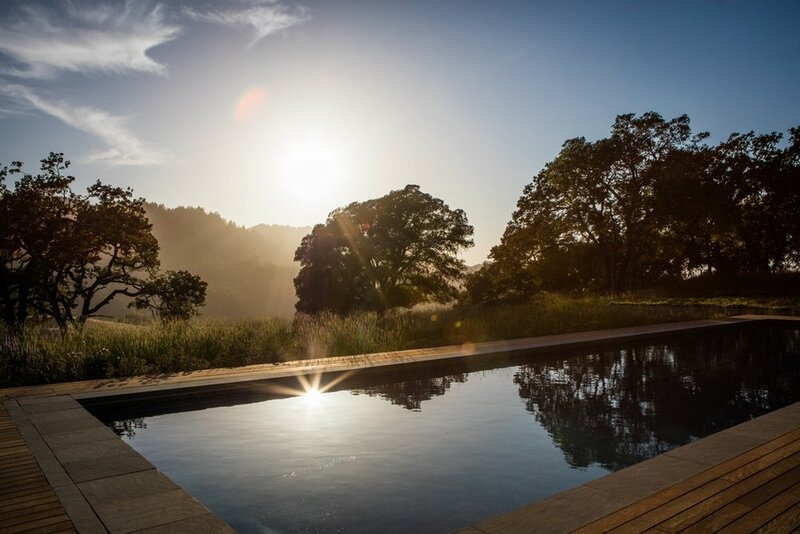 With commanding views over a nicely layered Dry Creek Valley landscape, we first developed an entry sequence that clearly delivers guests to the front door, eliminating confusion around the seven west facing portals. Massive Olive Trees were imported to scale down the mass of the old world structure and talk back to its inherent strength. 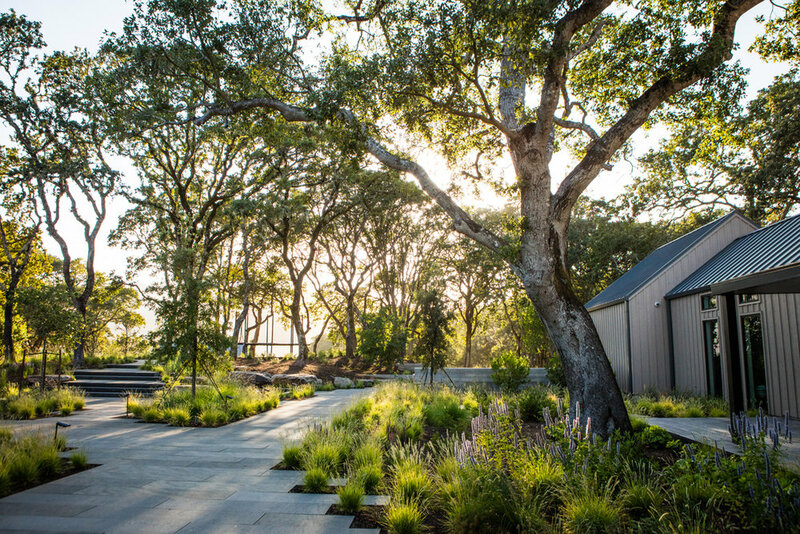 We then conceptually expanded the rear courtyard to incorporate an enormous Oak Tree and put it on stage as a sculptural element within the highly used garden and outdoor living space. Low muscular walls with exquisite masonry stand up to the two story stone building and create inviting places to linger. 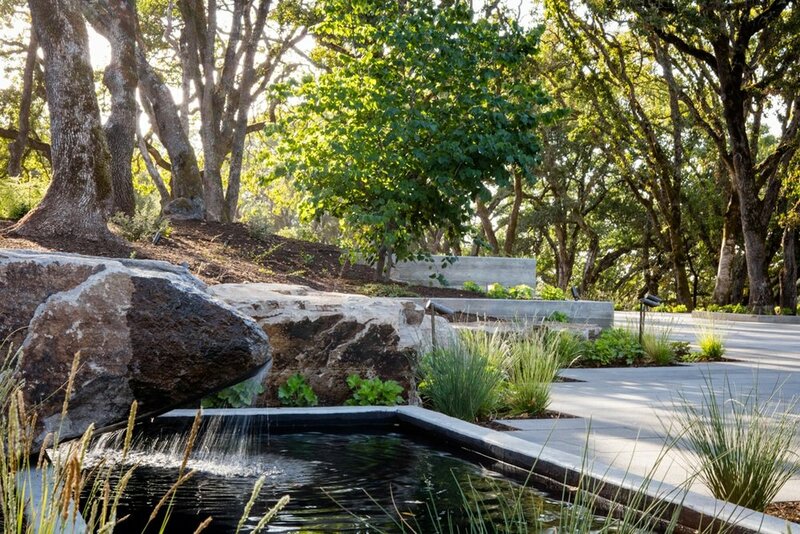 A modern reflecting pool bridges over to the new world addition of the home; this story of ‘old meets new’ was considered with every material choice and the construction of each element. 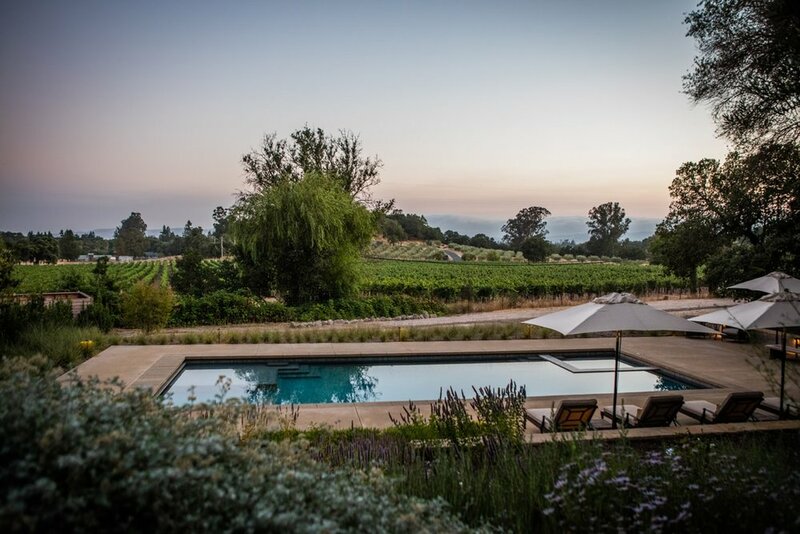 The swimming pool hangs over the edge of the vineyards and a small overlook seating area naturally emerged in a previously utilized location with the same use unbeknownst to me. 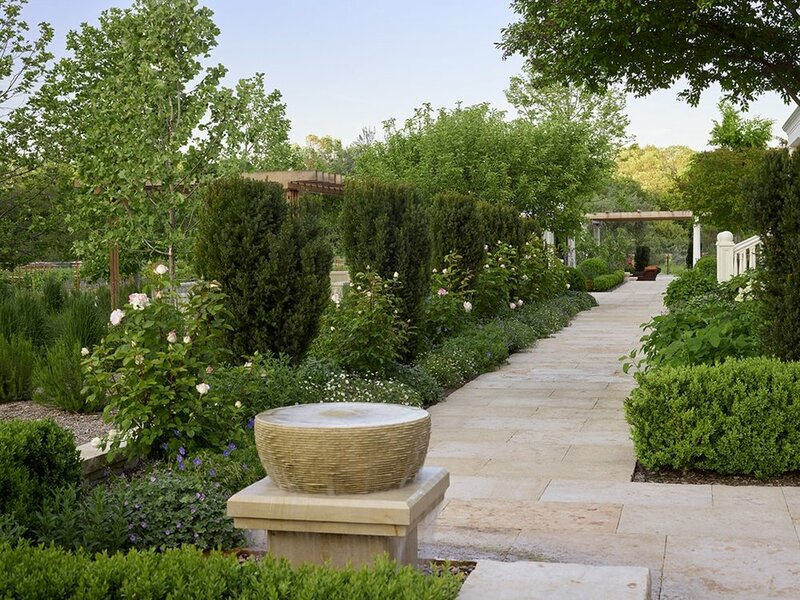 As true garden lovers, the new owners of this traditional home built in the 1990’s, wanted to upgrade the surrounding landscape and create more opportunities for outdoor living, along with adding a new garage, art studio and pool house to the Master Plan. 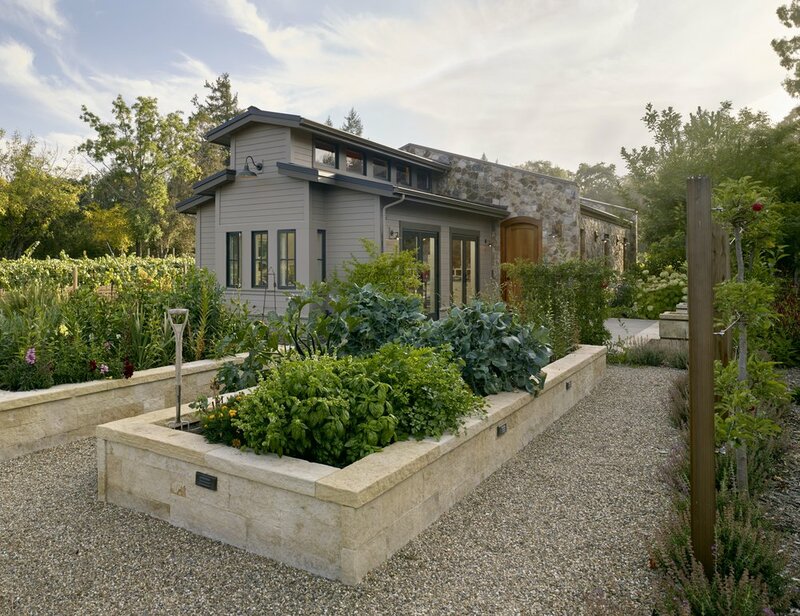 Working with the architect, we sited the garage on the south side of the residence and attached the studio to the backside, which is neatly nestled into the large pottage garden (her side). Access stairs were added to the side of the surround porch for easy coming and going. 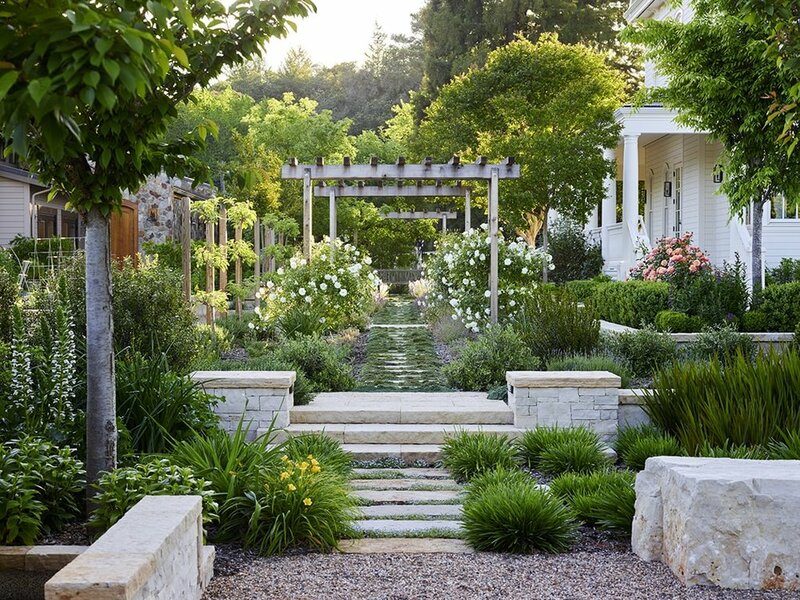 A series of rose covered trellises punctuate the transition from room to room on this garden side of the house. 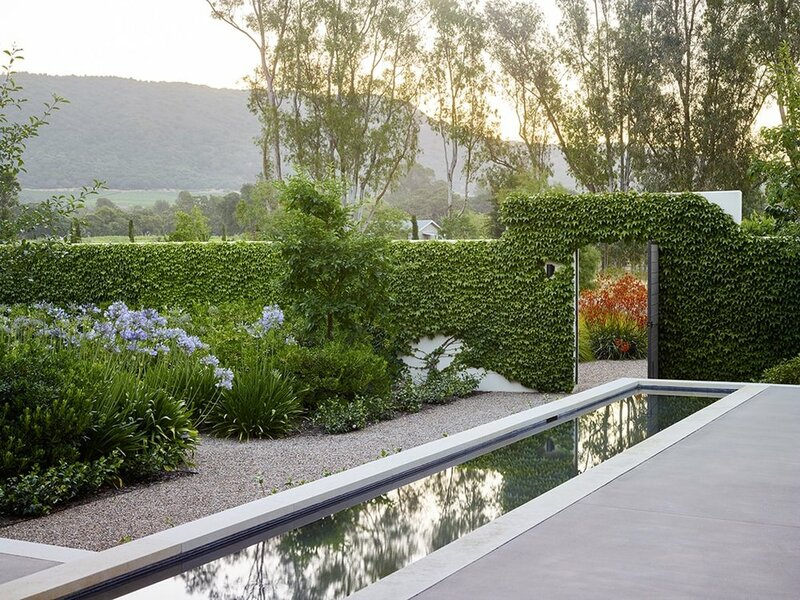 Access to the pool area is along the northern side of the house, where a small fountain captures the afternoon light and leads visitors to the poolside accommodations. 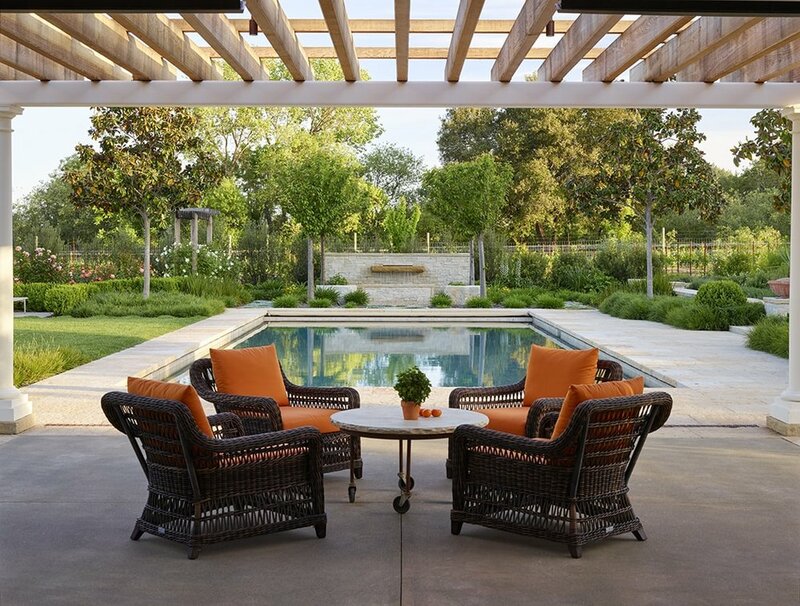 Regularly used and enjoyed by many, this traditional yet modern pool house opens front and back and provides shade for lingering at the water’s edge. Magnolias further punctuate the pool as does a water feature on the far end, whose sound neatly conceals the pool equipment behind. Lounge chairs are tucked into a newly created mid-level terrace that keeps the swimming pool clear of furniture and allows for more privacy and a private resort like experience. 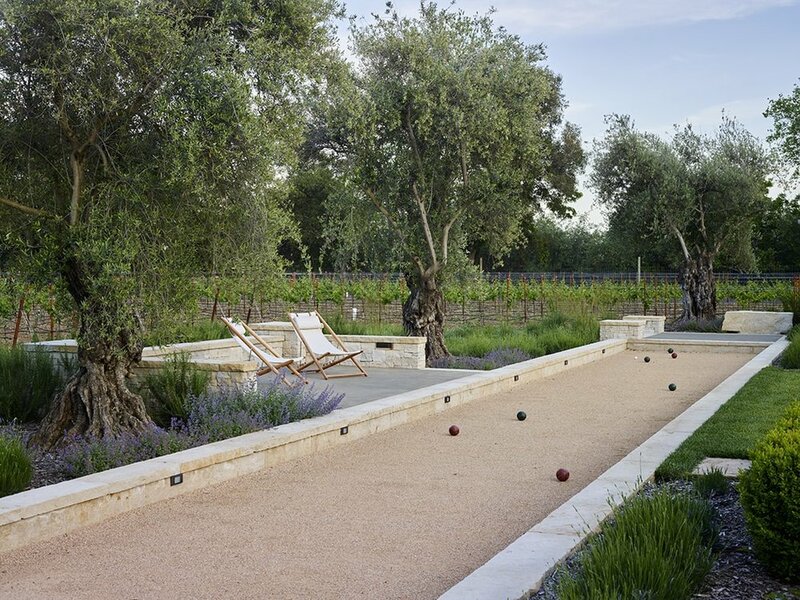 A bocce court terminates the back end of the gardens and overlooks the boutique vineyard and is punctuated by uniquely grafted old world Olive Trees. 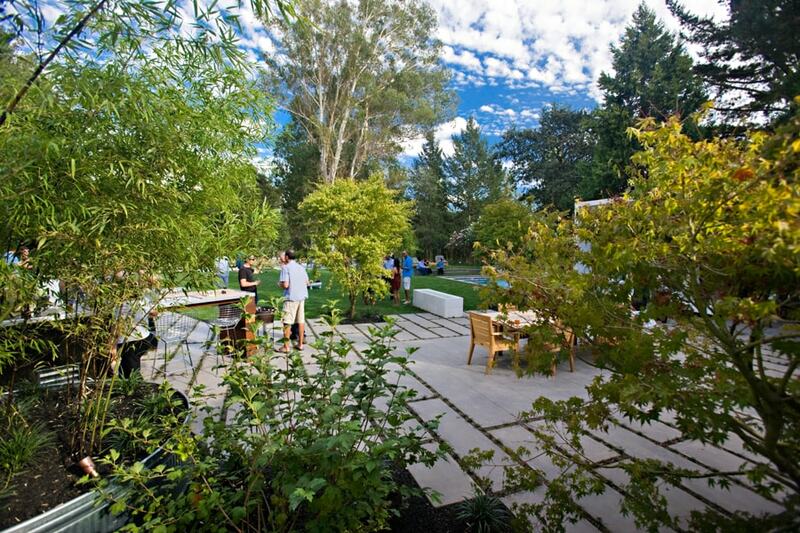 The main dining terrace and covered outdoor kitchen and bar combo are anchored by a contemporary fireplace and further shaded by Sycamore trees where food and wine are enjoyed by the happy residents and their lucky guests. Upon first arrival at this property in 2012, the existing home was under exploratory demolition and remodeling plans were underway. 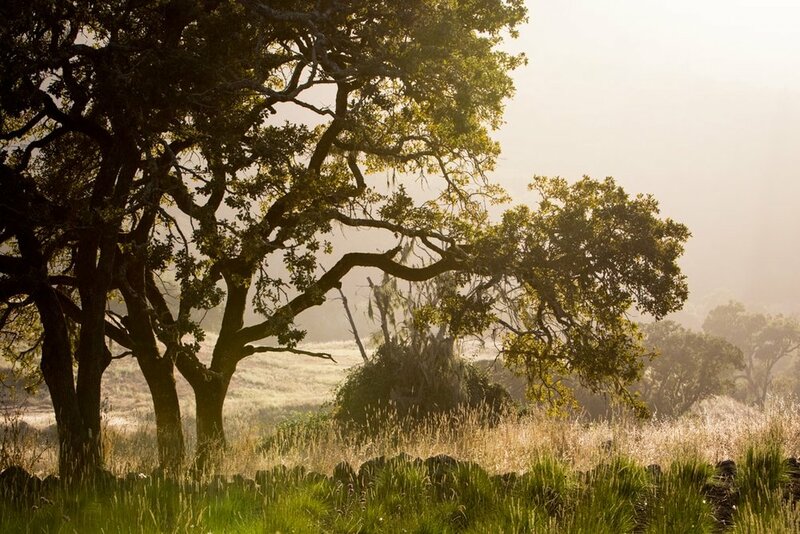 I was immediately taken by the well-established Olive grove that resided directly adjacent to the home and occupied a major portion of usable flat ground on this 6 acre site abutting vineyards to the south and wild lands to the north. The setting possessed an inherent sense of prospect and refuge, the ideal setting for true comfort. Unique opportunities for outdoor living were eventually developed below the canopy of these open and wild Olive trees (existing septic lines were relocated) and a swimming pool was placed in the only available sunny spot, the front yard, neatly concealed from the arrival area by a hedge that screens the space from view. 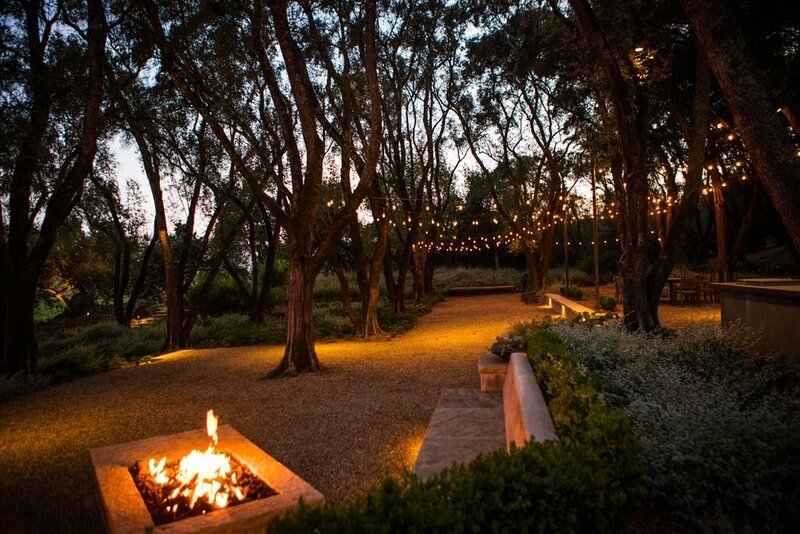 Further exploration of the property located a rocky knoll that was overgrown with scrubby shrubs and bramble, later transformed into a picturesque lawn and promontory with a wonderful fire pit tucked into an unearthed rocky outcropping. 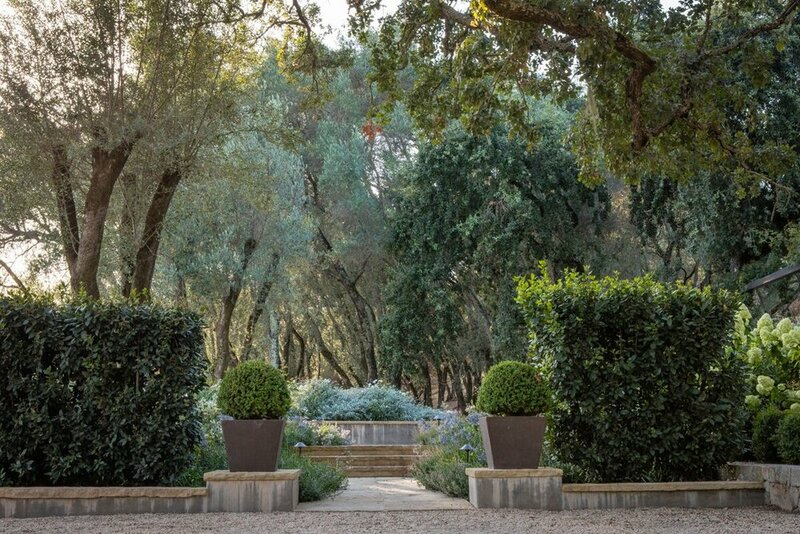 Formal trails that play off of the two grids of the home and olive grove unite the garden and provide access to the many component parts that make up this unique estate property just minutes from the town square in Sonoma. Completed in 2017, this extensive project was a true testament of commitment for all parties involved. 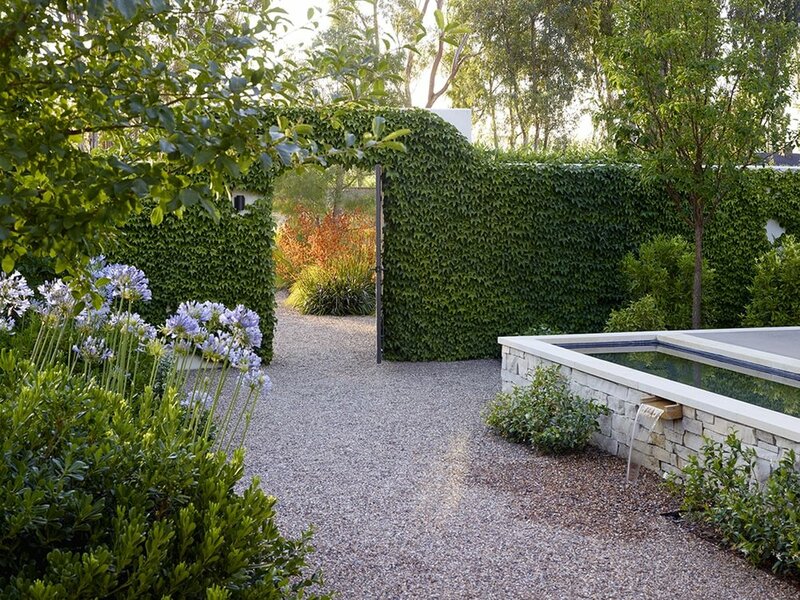 As exciting as estate garden projects are, the opportunities for creativity within the suburban backyard setting is always a welcomed commission. Typically without the strong contextual relationship to consider, new freedoms can be exercised and creative opportunities abound. This uniquely crafted project for an exuberant family of 5 had to meet their needs for play, both adults and children alike. 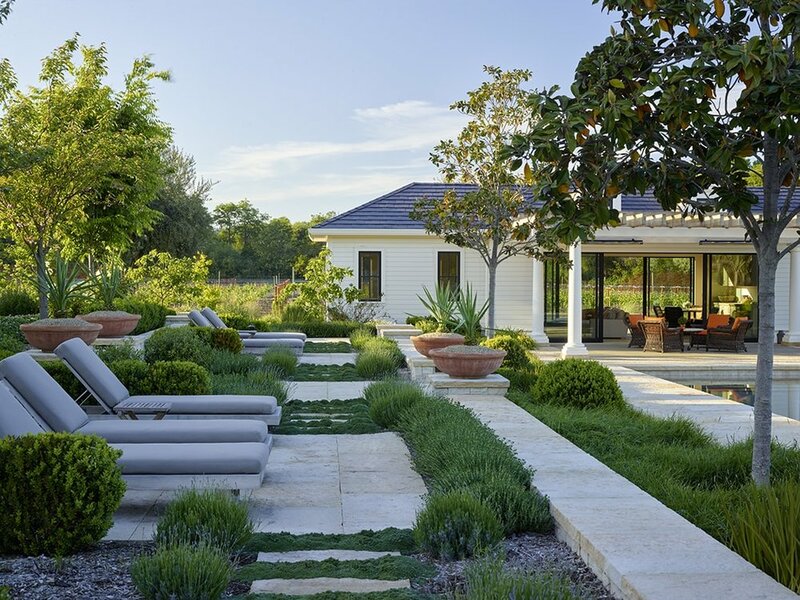 The crisp white pool house structure and associated white bottom swimming pool bring brightness to the shaded corner of the property, the only area allowed for development due to a centrally located septic system, where a bright green lawn was employed as a central sea from which all other elements branch off. Containers of bamboo create depth and separation in the space while preserving views back and forth and the leach lines below. Spoils from the pool excavation were crafted into grass covered earth forms and an elevated poolside lounge punctuated by a truncated pyramid. A certain magical quality was exuded by this somewhat feral land when I first stepped foot on site in 2012. 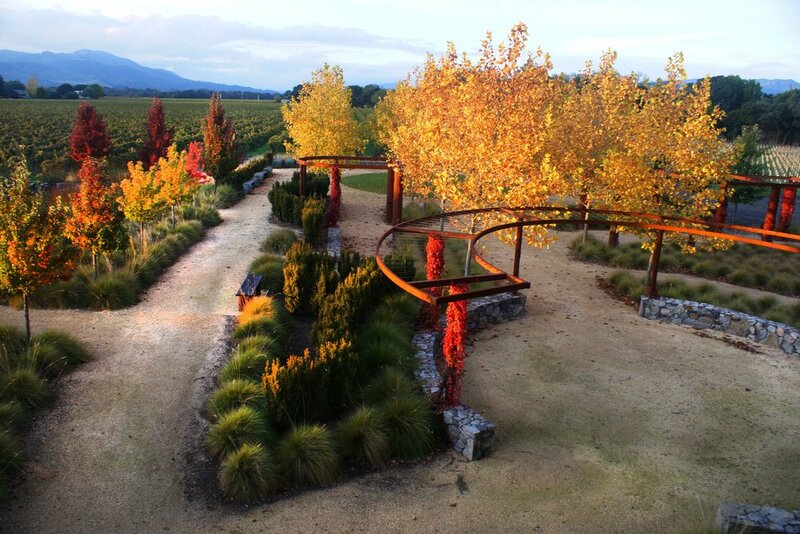 A collaborative approach to site planning for this 8 acre property was provided for the land owner who wanted the place as minimally developed as possible for reasons of budget, lack of potable water and general maintenance concerns. After careful consideration, a ‘modern mission’ concept was conceived as a means of civilizing the rather unruly site by drawing a hard line on development and creating an inner sanctuary that provides protection from the outside and frequent strong winds in the area. 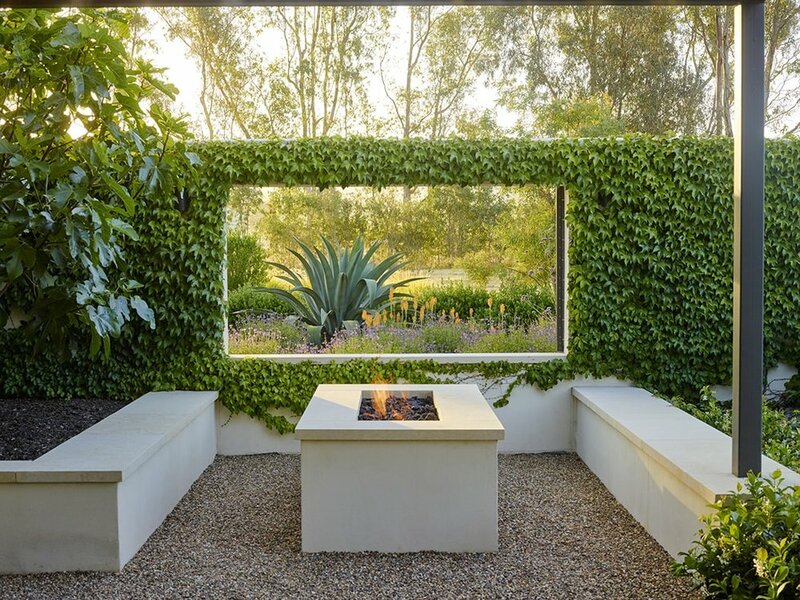 While not turning our backs on the inherent beauty of the place, the wall that defines the main courtyard was punctuated with doors, windows, and a breezeway to frame views of the property and surrounding landscape. The ‘back 40’ was somewhat tamed and brought into the fold by striking a strong central axis through what is now dubbed ‘the preserve’. 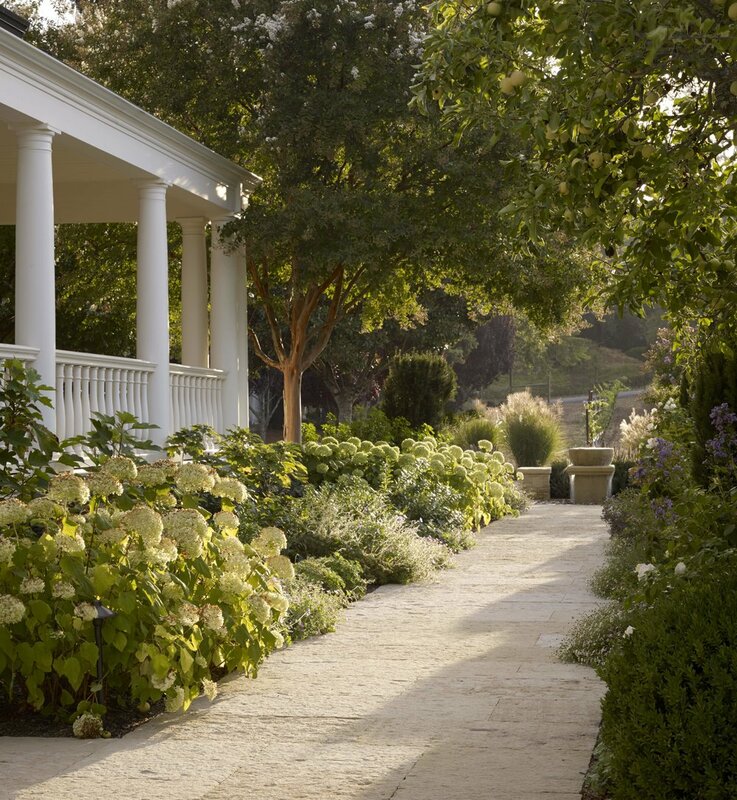 This center line organizes the interior of the court while also acting as an invitation for people out of the safety of the walled garden and into the less civilized yet tranquil surrounds. 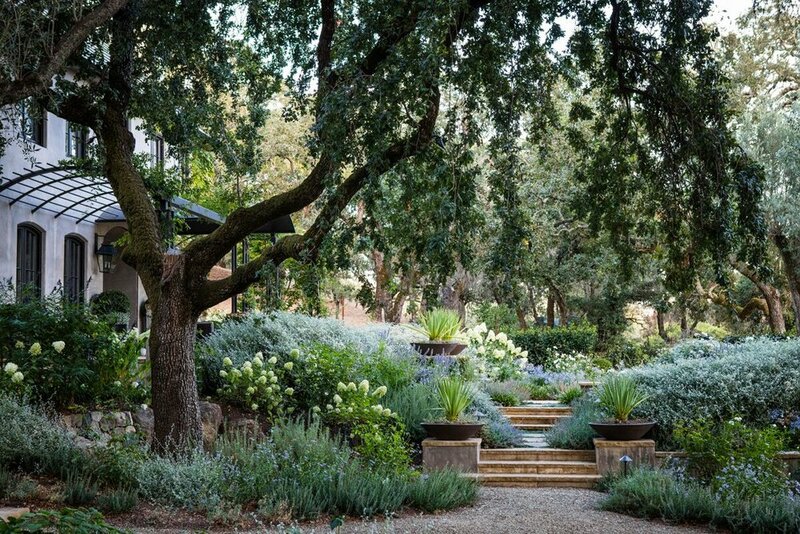 Exterior plantings play off of the established Eucalyptus trees, remnant pear orchards and native volunteers while interior plantings contrast as more cooling, white flowering and fragrant evergreen plants. 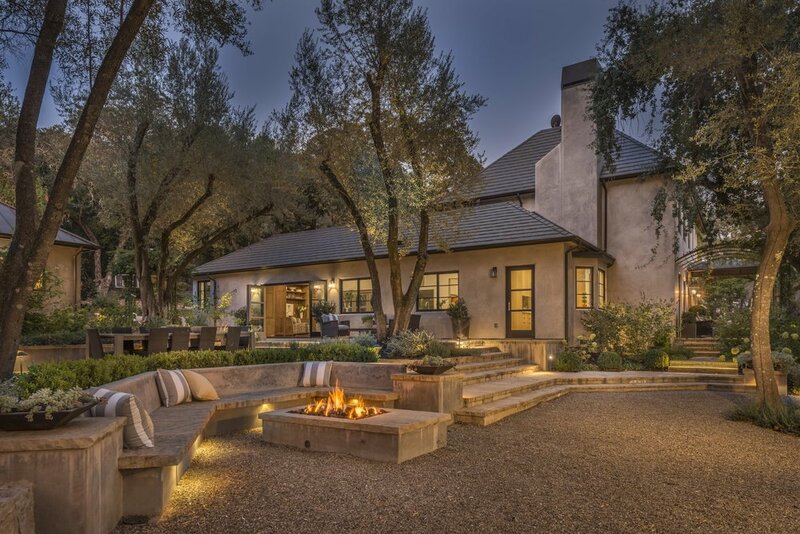 A central trough of water spills peacefully into the entry gravel walk and is the focus of the space, which is also enjoyed for outdoor cooking and dining and fireside lounging. 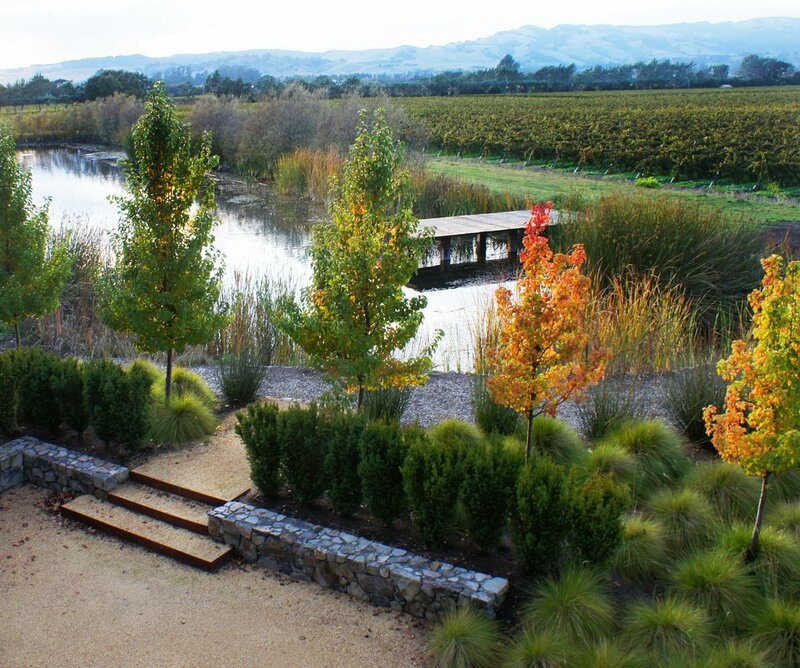 The relationship of vineyards to mountains and native creek to cultured rows lead to a strong architectural response for this unique private park that acts as picnic grounds and event space for Sangiacomo Vineyards, their family, workers and guests. 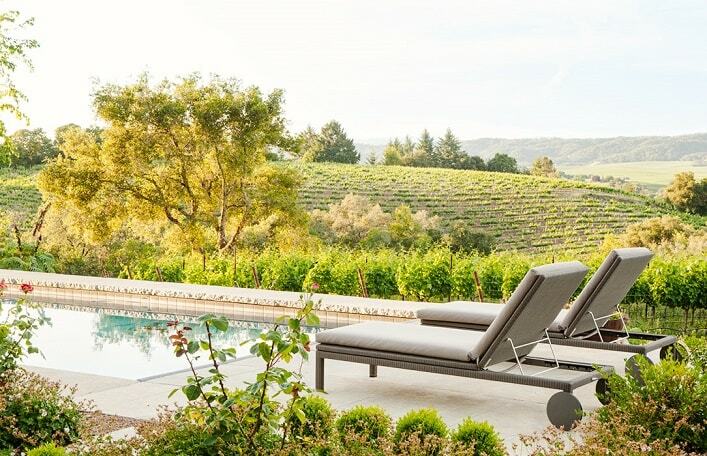 Large masses of simple plantings respond to the vast sea of grapes and afternoon light while fieldstone walls and Yew hedges define space and provide protection from the notorious Carneros winds. London Plane Trees and Ornamental Pear trees provide further protection from the elements while harking back to the family’s agricultural and Italian roots. 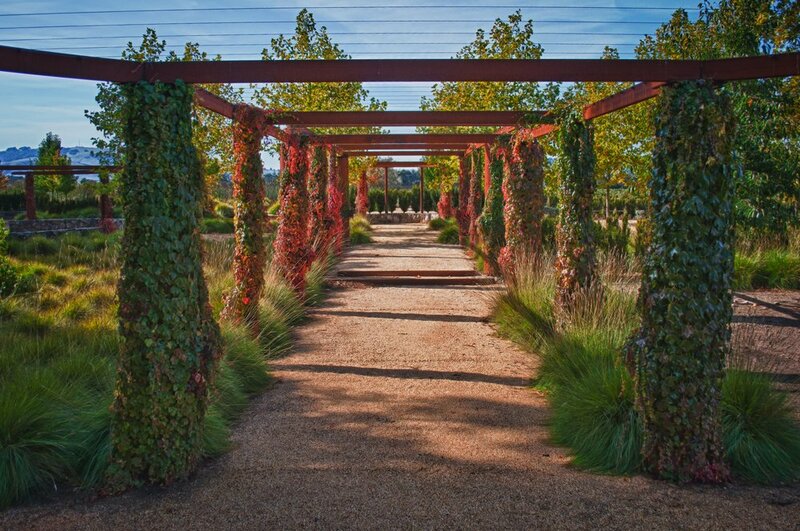 Reclaimed steel irrigation pipes from the site take on a new function as trellis posts while nodding to the industrial agricultural use of the property, providing a hint of whimsy to this classically structured series of outdoor rooms. Phase one was completed prior to harvest 2009. This modern home was but a steep grassy hillside when we were first summonsed to the site in 2011. 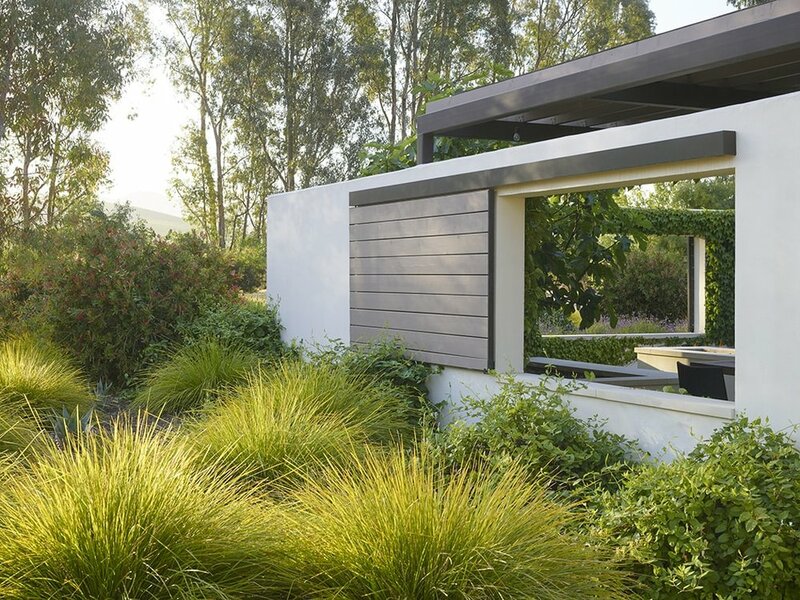 Charged with the task of site planning for a 6,000 square foot home, in collaboration with the architect, we assisted in locating and shaping the structure in such a way that a gentle entry drive and naturally unfolding arrival sequence could be achieved. 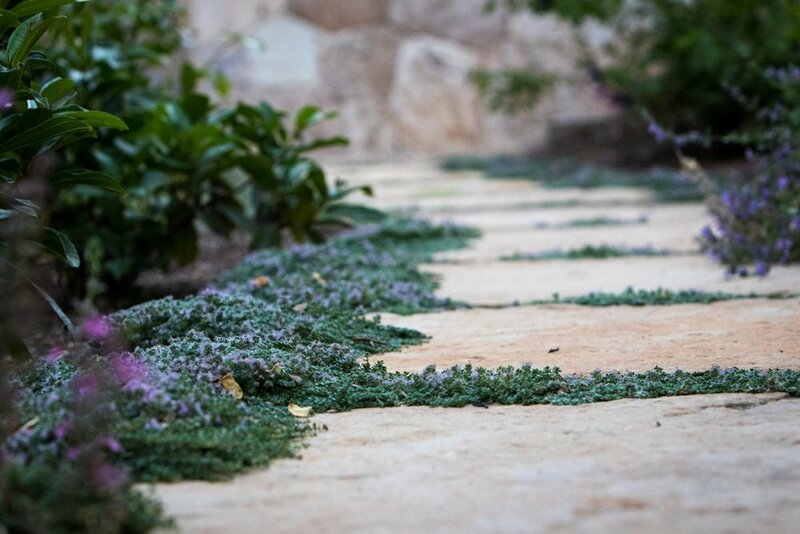 The home stretches out over nearly 300 feet in length due to the extreme topography yet blends seamlessly with the main terrace, free of hand rails thanks to a continuous trough of water that eventually cascades down to the lower terrace. 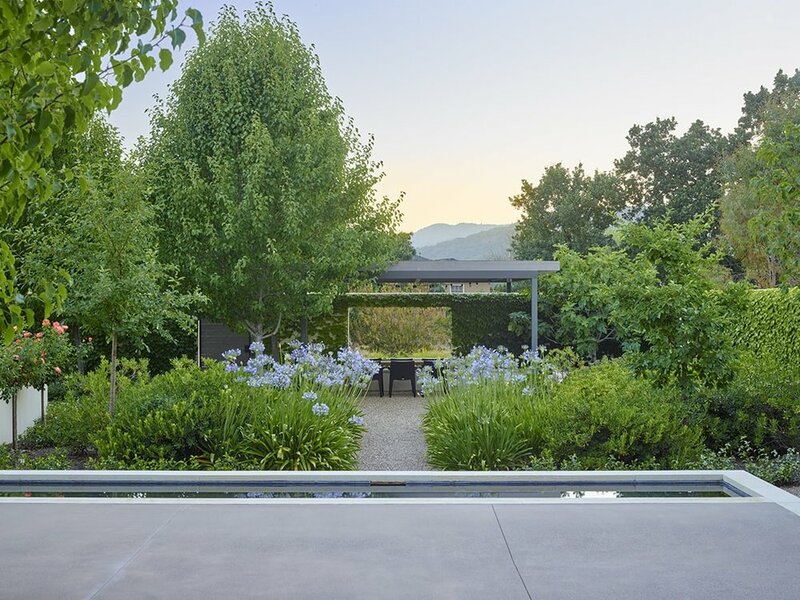 Walls carefully constructed of local volcanic material (Tufa) nestle the residence into the site, punctuated by a grove of Japanese Maples, relaxed plantings that flow up and down the hillside and a bocce court which bridges one side of the home to the other.